A History of Wine in America is the definitive account of winemaking in the United States, first as it was carried out under Prohibition, and then as it developed and spread to all fifty states after the repeal of Prohibition. Engagingly written, exhaustively researched, and rich in detail, this book describes how Prohibition devastated the wine industry, the conditions of renewal after Repeal, the various New Deal measures that affected wine, and the early markets and methods. Thomas Pinney goes on to examine the effects of World War II and how the troubled postwar years led to the great wine boom of the late 1960s, the spread of winegrowing to almost every state, and its continued expansion to the present day. The history of wine in America is, in many ways, the history of America and of American enterprise in microcosm. Pinney's sweeping narrative comprises a lively cast of characters that includes politicians, bootleggers, entrepreneurs, growers, scientists, and visionaries. 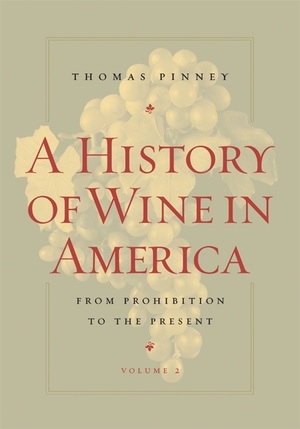 Pinney relates the development of winemaking in states such as New York and Ohio; its extension to Pennsylvania, Virginia, Texas, and other states; and its notable successes in California, Washington, and Oregon. He is the first to tell the complete and connected story of the rebirth of the wine industry in California, now one of the most successful winemaking regions in the world. Thomas Pinney is Professor of English, Emeritus, at Pomona College. He is the author of A History of Wine in America: From the Beginnings to Prohibition (California, 1989) and has published scholarly work on George Eliot, Lord Macaulay, and Rudyard Kipling.